Landfills present many environmental challenges, ranging from odor control to groundwater quality. Continuous, accurate monitoring of site conditions provides data that landfill managers can use as they address these challenges. Landfill managers in Pennsylvania collect and analyze meteorological data to help them optimize operations while minimizing impacts on the community. Ambient Air Quality Service (AAQS), a Campbell Scientific consultant and integrator, has installed and maintains multiple landfill monitoring locations in Pennsylvania. 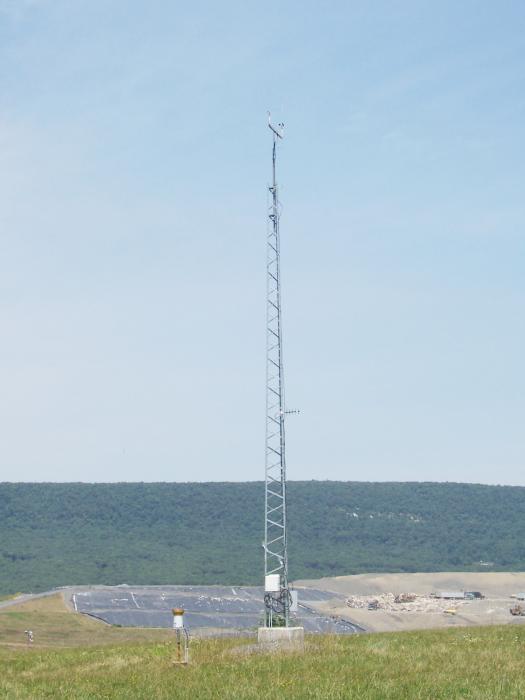 AAQS set up the Waste Management Alliance landfill in Taylor, Pennsylvania, with three meteorological monitoring locations. They use AC and solar power, Campbell Scientific's CR510 dataloggers, 10- and 20-foot tripods, RF401 radios, and sensors that measure wind speed, wind direction, temperature, relative humidity, and barometric pressure. SRM-5A short-haul modems extend the distance from the radio and datalogger to the base-station computer. At the Wayne Township landfill, AAQS installed a CR200 datalogger connected to a wind vane to control the misting system so it only runs when the winds are from certain directions, curbing odors and conserving expensive odor-neutralizing products. Although Pennsylvania regulations require only wind data, landfills also collect temperature and relative humidity to calculate wind chill and heat index, precipitation data to manage waste-water treatment, and barometric pressure to help analyze and operate flares. Landfills operate flares to burn off gases. CR1000 dataloggers and sensors have been added to flares to monitor temperature, flow, and oxygen. Much of the data collected at these Pennsylvania landfills is available on the Internet for staff, state regulators, and the community. LoggerNet software collects the data from the dataloggers, generates a daily report using LoggerNet Split, uploads the daily report and current data to a Web site developed by AAQS, and displays 48-hour trend graphs on the Web. AAQS has also developed a LoggerNet-based alert program that will notify landfill personnel in case of high winds or heavy rains. Alerts are sent to landfill staff via cell phones or email. Some landfills also use a LoggerNet program developed by AAQS to display the wind corridor of the most recently collected wind values. The program has successfully shown that an odor detected in the area could not have come from the landfill because wind did not flow across the landfill during or prior to the odor complaint. Landfill managers would much rather prevent environmental problems than have to deal with them after the public has been inconvenienced. Continuous monitoring of environmental variables can be an important part of this effort.